Aspiring to create a global and seamless community of Indian classical music rasikas, Saptak is unwavering in its stance. The Trust has on its board only musicians and connoisseurs committed to the ideals with which Saptak was formed. The Trust does not believe in commercialising music. Over the years, the institution has developed a supportive network, which backs its initiatives without overshadowing its unique spirit and style of functioning. Late Shri Nandan Mehta held a special place in the cultural landscape of Ahmedabad and continues to inspire a new generation of performers. Trained under Padma Vibhushan Pt. Kishan Maharaj, Shri Nandan Mehta was an outstanding tabla exponent of the Banaras Baaj. Apart from being a noted performer and a guru, he was respected as an institution builder who helped promote our rich musical heritage. He was honoured by Pt.Jasraj twice (1997 and 2002) on behalf of Mewati Gharana and was conferred the title 'Tal Rasik Var'. "Sankalp" central body at Kurukshetra conferred the title of 'Sangeet Rushi' in the year 1996. Kumar Club Shastriya Group Ahmedabad has also honoured him for rendering outstanding services in the field of classical music. He has been awarded the prestigious 'Gaurav Puraskar' by the Gujarat Sangeet Natak Academy for his outstanding contribution in the field of music in the year 1988. He has also been honoured on 'Vishwa Rang - Bhoomi day' for his contribution in the field of music in Vadodara, and by the Medical Association in Ahmedabad. Swar Sadhana Samiti, Mumbai, has awarded him 'Swar Sadhana Ratna' in the year 2004. He has also been honoured by 'Kala Gurjari' Bhavnagar, Sangeet Kala Niketan, Jaipur. He has also honoured by Madhuvan, Bhopal for his contribution in the field of music in the year 2005 and was conferred the title 'Shreshth kala Acharya'. Dr.H.L.Trivedi, Director, Kidney Institute has also honoured him for rendering outstanding services in the field of Classical music and conferred the title "Bhagwan Mahavir Karuna Sewa Sanman" in 2007. Sangeet Natak Akademi, New Delhi conferred the "Sangeet Natak Akademi Award" for the year 2007. He was awarded "Sangeet Ratna Chudamani" by Divya Jivan Sangh Shivanand Ashram Ahmedabad in 2008 by Hon.Shri Naval Kishore Sharma, Governor of Gujarat. He is the founder of Saptak School of Music along with a few musicians and connoisseurs. The school has followed a distinctive tradition of training through Guru-shishya parampara. At the same time it has managed to take a large batch of students through innovative classroom practices. The school has various departments viz. Vocal, instrumental and percussion. The students of the school have blossomed into budding performing artists. The sincerity with which 'Vidyadan' is organized is reflected in the comments made by a person like Pt.Kishan Maharaj. On several occasions he has remarked that the authentic Banaras Baaj is played more in Ahmedabad than any other place in India. 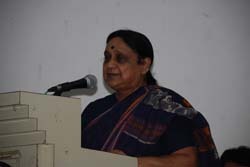 A founder Trustee of Saptak, Smt. Rupande Shah hails from a family which has contributed to the development of cultural and music institutions in the city of Ahmedabad. Her father late Shri Kantilal Manilal was a great connoisseur of music. From her childhood, she was initiated in various performing arts, viz. music, dance and drama. Her music study started at home at a very early age under Shri Raosaheb Mhasker of Gwalior Gharana. She started her dance training at Darpana at the age of 8 under the guidance of Smt. Mrinalini Sarabhai and Shri Chatunni Panicker. At Darpana she got intensive training in Bharatnatyam, Kathakali and Kuchipudi for more than 10 years. She received the first prize in classical dance at the All India Inter-University Youth Festival at Delhi in '58. She was the first student of Darpana to perform the Arangetram in the year 1960 at the age of 20. She has travelled widely all over India and through out the World with Darpana as one of the lead dancers. She performed in famous ballets, like Tasherdesh, Bhanusinher Padavali, Geet Govind, Kurvanchi etc. She also performed solo at various places in India. She received critical acclaim for her performances. At Darpana she also participated in the Gujarati theatre. She acted in several plays and performed lead role in Shilapadikaram, Navalsha Hirjee, Nishkruti etc. Her performances received rave reviews. She received the Best Actress Award of the Sangeet Natak Academy in the year 1975/76. She also appeared in various TV drama serials during that period. In 1963 she accompanied Smt. Mrinalini Sarabhai to visit the Institute Of Advanced Studies In Theatre Arts in New York as an Assistant Director to her for staging the Sanskrit Play, Swapna Vasavdatta with an all American cast. At Darpana she also imparted training to young students in Bharatnatyam and Kathakali for several years. Even when she was focussed mainly on dancing she continues her training with Shri Rasosaheb Mhasker. She devoted herself to Rabindra Sangeet and Gazal singing under Shri Surendra Jaitley and was a performing member of the Geetali Group. After that she pursued her training very seriously in Classical Music. Ustad Gulam Kadir Khan, Pandit Maniramji and Ustad Gulam Ahmed Khan imparted her intensive training. Finally Pandit Rajan Mishra guided her in the Banaras Gharana style, helped her to expand her repertoire and initiated her in the finer points of concert performance. She has developed her style of singing in which Gwalior Gharana, Agra Gharana, Mewati Gharana and Banaras Gharana are seen and reflected. She is a regular A grade AIR and TV Artist. She has given performances in major cities of India and has given recital in the most prestigious of Akashwani concerts viz., Tuesday night concert, Saturday National Programme of music, twice and Diwali Sangeet Sammelan three times. She has been awarded the prestigious Gaurav Puraskar by Gujarat State Sangeet Natak Academy. Mumbai'NCPA, Shivranjini, Sajan-Milap and other music circles. New Delhi'Gunudas Sangeet Samaroh Smt Siddheshwari Devi Academy,Dagar Smriti Samaroh and Other music circles. Vidushi Smt. Manju Mehta is one of leading sitarists in India today. She hails from a reputed family of Jaipur known for its musical lineage. She received her initial training from her elder brother Pt. Shashimohan Bhatt, a noted sitarist. Her early virtuoso performances earned her the Central and State Government scholarships and help her pursue her training under Shri Damodarlal Kabra and completing her Masters in Music with top honours. Her prodigious talent came to light when she won the prize in AIR Talent Search Competition. 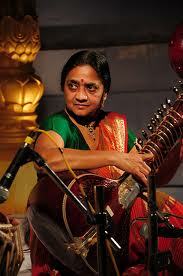 Since 1980, Smt Manjuben has been receiving guidance from the sitar maestro Bharat Ratna Pt. Ravishankar. It was a rare privilege and honour for Smt Manjuben when her sitar recital was included in an album released to mark Panditji's 80th birthday. A top grade artiste of Doordarshan and AIR, Smt. Manjuben has performed several times for All India Radio's National Programme of music and the Akashwani Diwali Sangeet Sammelan broadcast. Smt Manjuben has performed in music festivals in India and concerts abroad and is rated as a performer of the highest caliber. Spontaneous creativity, rhythmic control, exquisite balance and proportion flows naturally through the strains of her sitar. One of the founder trustees of the Saptak School of Music, she devotes considerable time on the promotion of Indian Classical Music. Smt. Manjuben is a teacher par excellence and has been mentoring aspiring sitarists in Ahmedabad for the last 35 years. A recipient of several top honours and awards, Smt. Manjuben has received the special Pt.Omkarnath Award by Gujarat Government and the prestigious Guarav Puraskar by the Sangeet Natak Academy of Gujarat. Some of the other prestigious awards include ' The Sangeet Kala Ratna and Sangeet Martand Samman by the Akhil Bhartiya Dhrupad-Naad-Ninaad Virast Samaroh-Jaipur, Sangeet Kala Gaurav Puraskar by the Sangeet Kala Kendra, Agra, and the very prestigious Marwar Sangeet Ratna Award presented by Maharaja Gajsingh of Jodhpur. Born in 1938 at Mumbai, Smt. Bharati Parikh hails from a noble and cultured family, which has made immense contributions in the sphere of education and religious activities in the society. Smt Bharatiben started pursuing her interests in music and dance from a very young age. This passion for music was to be the basis of her involvement with Saptak and she continues to take an active interest its activities and programmes. Smt Bharati Parikh is also associated with several other organisations. She joined Ahmedabad North Junior Chamber and was a chartered member of Inner Will Club of Ahmedabad South and became its office bearer at the district level. Keenly interested in social service and service to humanity, a trait that she inherited from her father, Bharatiben is associated with Gujarat Sarvar Mandal ' an institution, which helps poor and needy patients. For over 35 years Smt Bharati Parikh has been actively associated with Ahmedabad Cancer Society and has offered her services in various avenues in the institution. At present she is a Treasurer in the executive committee. Bank of Baroda Regional Training Centre. Hetal Mehta Joshi is the daughter of well known tabla player Pt. Nandan Mehta & sitarist Manju Mehta. Born into a family of eminent musicians, Hetal has learnt the Tabla from a very young age from her father Shri Nandan Mehta, senior most disciple of Padma Vibhushan Pt.Kishan Maharaj, the illustrious Tabla maestro of the Benaras Gharana from Gujarat. She has also had the opportunity of occasionally taking guidance from the legendary doyen of the Banaras Gharana Padma-Vibhushan Pt.Kishan Maharaj as well as his son Pt.Puran Maharaj. Having had the opportunity of minutely observing the various nuances of Tabla playing from various maestros performing at the prestigious Saptak annual festivals over the last 20 years, Hetal has developed a refined sense for the art of Tabla playing and has matured into a very fine soloist as well as accompanist. This is reflected in her very refined style of playing Banaras style of Tabla which is rich in Gat ' Fard, tukdas and punjabi or Lahori gats, which are the distinguishing features of Banaras Baaj. She has performed at various concerts in major cities of India i.e All over Gujarat, Mumbai, Jaipur, Bhopal, Delhi, Gwalior, Kurukshetra, Kolkata, Pune etc..for reputed organisations of those cities. She has won the First Prize in All India Radio Music Competition held in 1998, and has won the Shri Vishwanath Dev Sharma Classical Music award competition ' 1998 and has given solo performance & accompaniments in New York in November 1999 for that organisation. It was Padmavibhushan Pt.Kishan Maharaj's way of recognising her talent that he blessed her by asking her to be a co-accompanist in the Saptak concert of Sitar maestro Pt. Monilal Nag and Ms. Mita Nag. Such exposure has groomed her not just as an accomplished solo player but a recognised accompanist. She has accompanied veterans like Padma Vibhushan Pandit Jasraj, Padmashree Ustad Sultan Khan, Padma Vibhushan Pt.Rajan Sajan Mishra, Padmashree Pt.Vishwa Mohan Bhatt and many other young upcoming artists of our country. She is an A grade artist of Akashwani and Doordarshan. To add to this, Hetal is also a double graduate in English literature and B.ED from Gujarat University. 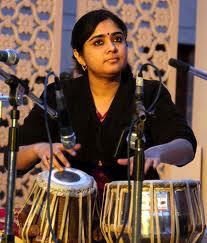 Presently she is the trustee of Saptak School of Music, Ahmedabad where she also teaches Tabla to senior disciples. She is one of the faculty members (lecturer of tabla) at the Upasana School of Performing Arts, Gujarat University. The two worlds of management and music may seem quite different and a world apart, but not for Mr. Prafull Anubhai who is quite at ease and very well known in both these diverse spheres. A music connoisseur known for his discerning taste in music, Prafull Anubhai also spearheads Saptak's latest initiative of digitising, recording and documenting Indian classical music for posterity. Backed by several years of professional expertise in management and management studies, Prafull Anubhai heads Arohi Consultants Pvt. Ltd., a management consultancy firm in Ahmedabad. He also officiates as the Chairman/Director of several public/private limited companies engaged in Textiles, Pharmaceuticals, Mutual Funds, Off-shore Funds, Housing Finance, Oil-field Equipment, Fine Chemicals etc. He has travelled extensively both within the country and abroad on professional assignments and was invited to Japan in 1972 under the Invitation Programme of the Japanese Government for Prospective Business Leaders. He has also attended Conference on Per Capita Fibre Consumption Survey organised by Food and Agricultural Organisation of the United Nations in Rome in 1982. Deeply involved to cause of learning and education, Mr. Prafull Anubhai is also associated with several premier educational institutions in Ahmedabad. 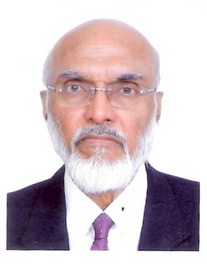 He is the Member, Board of Governors, Indian Institute of Management, Ahmedabad. Member, Governing Body, Ahmedabad Education Society. 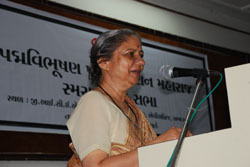 Member, Executive Committee, Ahmedabad Textile Industry Research Association ATIRA. 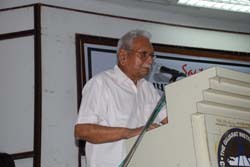 Mr. Himmatlal Chimanlal Kapasi,is an advisor at Saptak. A versatile and artistically inclined person, 'Kapasi saab' as he is affectionately known, combines several interests. He is an educationist, a music connoisseur, a film columnist and critic and a sports enthusiast. A Managing Trustee and founder of Shree Vidyanagar High School, Kapasi saab had been closely associated with the New Film society for many years. He has also authored two books Cinerag (on films) and Swarlok (on Music). He has been a Jury member at the Akashwani Music Competitions and has also encouraged young aspiring talent in sports. Infact, Parthiv Patel, the star wicketkeeper batsman is a student of Vidhyanagar High School.